7554-3DM ~ The Best GamEs.. SpOt !!! Like many other Vietnamese game studios, the biggest objective of the 7554 team is to get Vietnamese gamers to play Vietnamese games, which will limit the dependence in foreign products and witness the thriving of high technology in Vietnam. 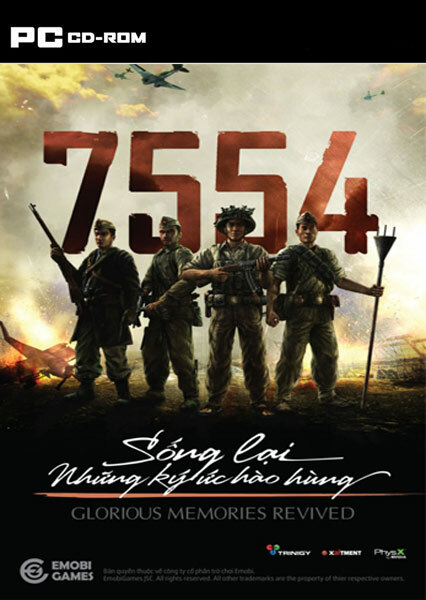 7554 takes place in Vietnam during the period from 1946 to 1954, in which the nation invested all of its means, from spiritual support to human lives, to protect its young and feeble independence. 7554 began with the first days of the war of resistance, and ended with the victory whose name had passed all over the globe: the Điện Biên Phủ campaign. 7554 uses fictional characters, but real historical events related to either famous battles, or heroic icons. 7554 is not an attempt to recreate the past, like a documentary, but an entertainment product based on historical events. 7554 remained completely loyal to the truth, but some small details may still be mistaken or reasonably exaggerated. They will not cause any cultural of historical debate. 7554 will also help to pass on historical facts to gamers. The game is built with the most modern game development technologies. 7554 uses the Vision Engine 8, This engine is a product of Havok (previously Trinigy Inc). With this quality engine, the arts in 7554 are going to be realistic and detailed. Vision Engine 8 also provides a great render for light and shadows. 7554 uses the PhysX engine from Nvidia. Thanks to PhysX, the physical effects in 7554 are more realistic. PhysX is used mostly for character controller, collision detection, simulation of mechanical implements, “ragdoll” simulation, cloth simulation (PhysX Cloth, for flags and parachutes). 7554 uses the modules XaitMap and XaitControl from the AI SDK (software development kit) of Xaiment (Germany). 7554 is a FPS game; in general gameplay and control can’t get so different from other games of the same genre. However, besides from the unique plot, 7554 will have other improvements so that it won’t be just a double of another game. For example, the dynamic day time system, or the gun control mechanics. Attention! To include English subs needed: the main menu, go to the “TY CHNH” >> “NGN NG” >> ENGLISH and include English subtitle.